I been with strangers all day and they treated me like family. I come in here to family and you treat me like a stranger. Have a belief in yourself that is bigger than anyone's disbelief. As soon as white folks say a play's good, the theater is jammed with blacks and whites. Between speeches and awards, you can find something to do every other week. It's hard to write. Your focus gets splintered. Once you put one thing in your calendar, that month is gone. Suffice it to say, I'm not poor. Jazz in itself is not struggling. That is, the music itself is not struggling... It's the attitude that's in trouble. My plays insist that we should not forget or toss away our history. In 1969 he married Brenda Burton a Muslim and Wilson converted to Islam in order to sustain the marriage. At 20 he decided he was a poet and submitted his poetry to such magazines as Harpers. In 1980 he received a fellowship for The Playwrights' Center in Minneapolis. 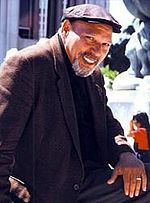 August Wilson (April 27 1945 – October 2 2005) was an American playwright whose work included a series of ten plays The Pittsburgh Cycle for which he received two Pulitzer Prizes for Drama.